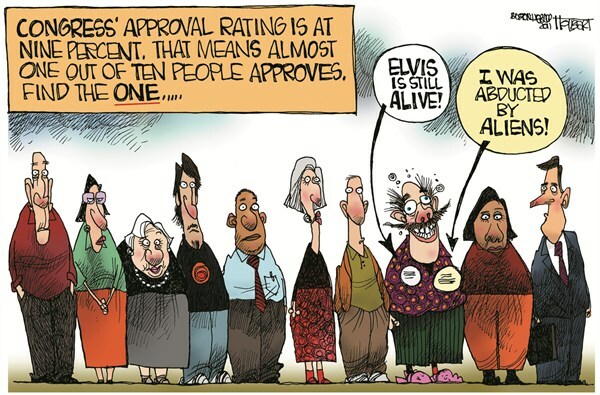 According to a recent Gallup poll, the United States Congress currently has a 10% positive approval rating and an 83% disapproval rating. Approval ratings are essentially the same across all partisan affiliations (ranging from 9% approval from Democrats to 11% approval from Independents). These amazingly low polling ratings are tied for the record low in all of the 38 years that Gallup has been doing public-approval polling. 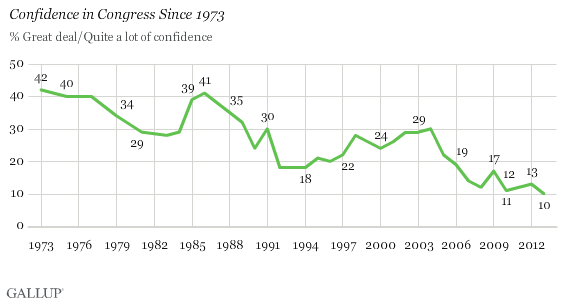 While the Gallup pollsters admit that it is very difficult to attribute a single cause for this low approval rating, they theorized that it could be related to a combination of a poor economy and the currently divided government (Republicans controlling the House while Democrats control the Senate and presidency). In all due respect to the Gallup follow-up poll, I think that their open-ended follow-up failed to identify a very important meta-issue that could describe the low approval of Congress. The meta-issue of corruption due to campaign finance deregulation is a long-term background issue that has the potential to corrode public trust more subtly than a single act. Some issues are simply so pervasive that people take them for granted; people accept the situation as the status quo and the may not like it, but they are unlikely to point to it in such an open poll (they focus in the acute issues). For years, the American government has had an increasing problem of being seen as corrupt or catering to special interests—the decision of Citizens United and the birth of the Super-PAC only accelerated this trend. When people see corporations and individuals handing out thousands, if not millions, of dollars to fund campaigns, they very-rightly have worries that such money will corrupt their politicians. Correlating well with Congress’s 10% approval rating, recent polls have indicated that approximately 90% of the American people believe that there is too much money in our politics. Given the similar results of these polls, it is entirely possible that many of the same people who believe that money has bought our politicians dislike the politicians who they see as corrupt. It stands to reason that somebody who believes that their politicians are being corrupted will have an overall negative view of the institutions that they see as corrupt. People may not immediately identify this as the root cause of their malaise—the symptoms are often more memorable than the underlying disease—but the fact remains that a statistically identical percentage of the American people have a low opinion of Congress and believe that Washington has been corrupted by money. Put plainly, the erosion of campaign finance laws brings about distrust in the public of their elected officials. This distrust has erupted in protests over the last few years, including both the right wing Tea Party and the left-leaning Occupy protests, and—in my opinion—has led to people losing faith in Congress. Just as how Gallup’s poll shows how people on both ends of the political spectrum have lost faith in Congress, people on both end of the political spectrum have begun to protest the perception of corruption in Washington. While there is no concrete evidence proving that campaign finance deregulation led corruption has led to the collapse of faith in Congress, the data shows a remarkable correlation. More study is certainly needed on whether this specific correlation is actually causation, but the theoretical evidence does show that this causation is both realistic and likely—multiple studies demonstrate how perceived corruption corrodes public trust in government, regardless of partisan affiliation. Even if it is proven that campaign finance deregulation is a major causal factor in the decay of trust in Congress, there is little that the legislature can do to mitigate the problem. The Buckley v. Valeo SCOTUS decision ruled that money is speech, while the Citizens United v. FEC decision ruled that corporations can “speak” using their money in the political arena. As these decisions are binding, the legislature is unable to mitigate this corruption without passing a Constitutional amendment (which is difficult in the best of times, never mind that fact that corrupt politicians are unlikely to vote for an amendment which will stop their corruption). If my argument in this matter is correct, it is unlikely that Congress will be able to break out of its approval quagmire and return to a legislature that has high approval ratings in the near future—the inertia is on the wrong side of change and the perception of corruption is here to stay for the foreseeable future. I really apreciate individuals lije you! Take care! !